I taught a class how to make a Jacobs ladder album last week. The butterfly on the front is stamped onto Velum, set aside to dry and them cut out and dusted with perfect pearls. You can find a picture tutorial over here on SCS! 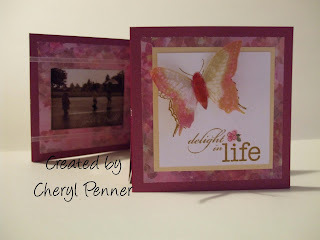 The Butterfly Stamp is from See D's and the dellight in life stamp is from Stampin' Up! I printed my pics in a 2" x 3" size in Sepia.